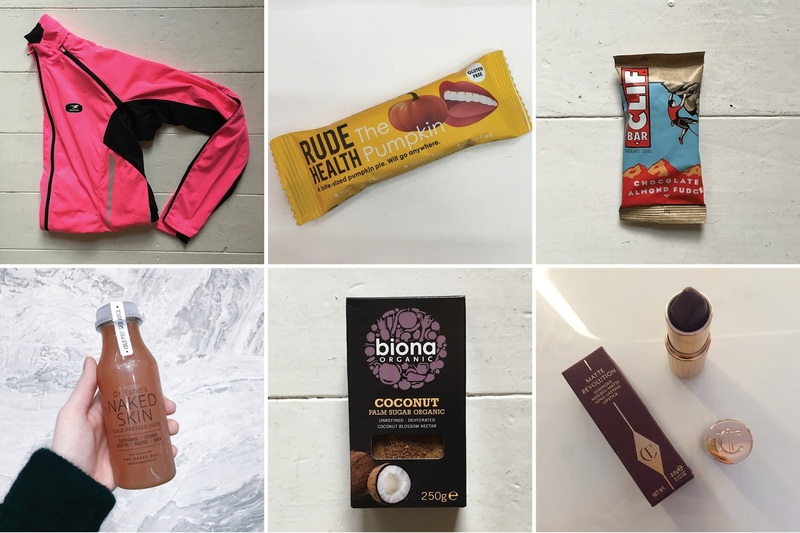 Quite simply, here’s a round-up of my favourite things from October, from the worlds of nutrition, fitness and beauty. My winter cycling training and fully commenced (good lord, it’s cold out there) and this brilliant jacket (similar here) has been a staple of my kit in the past month. It’s that good, that I’ve actually been wearing this for running and bootcamp sessions too. I know, I know – Halloween is over but these little guys have been great for stashing in my handbag this month. Basically these cold-pressed bars are packed with cashews, dates, spices etc. Yeah, as with all processed health food bars, they pack a bit more sugar than I would like, but I’ve been really enjoying these for a quick snack on the go. Rude Health do a great beetroot version too which is equally as tasty. Another convenience food, whoops. I first discovered Clif bars in LA a couple of years ago and remember buying pretty much every flavour I could get my hands on thinking that these weren’t available in the UK. Well, they are! They’re damn tasty and a brilliant pre-workout snack, especially before intense training (long run, heavy weights session, bike ride etc). This flavour is up there with the best – chocolate + almonds + fudgey oaty goodness. What else is there to say? Now that I think about it, this is more of a general life favourite – it’s that good. The Naked Deli are a brilliant healthy eating cafe (which I’ve mentioned a bunch of times) and they’ve now opened up a concession in Fenwick Newcastle’s new food hall which is fantastic news for those seeking clean food ready prepped for them, and also dangerous for lunchtime, if, like me you work in town, because I WANT TO BUY EVERYTHING. I’ve had loads of ND lunches in the past couple of weeks and have been especially loving the juice range made in collaboration with Dr Esho. Is there anything you can’t do with a coconut? Apparently not (see coconut jam. Yes. Jam). I’ve used coconut sugar for the past few years in baking – it’s a great unrefined alternative to the normal sweet stuff, and has a warming caramel flavour too (yum). Autumn/Winter makes me want to bake as much as possible, and I’ve been using Biona’s version in pretty much everything in the past month. It’s especially good in a healthy hot chocolate (warm up almond milk, add raw cacao powder, a pinch of cinnamon and coconut sugar – delish). My name’s Alice and I love Charlotte Tilbury (and so should you). I’ve been testing out a few things recently and resurrecting some old faves. I’ve had the Matte Revolution Glastonberry lipstick for a few months, but I’ve been reaching for this more and more in the last month – the plummy red-brown shade is ideal for this time of year. Items marked * have been sent to me to review and I have no obligation to feature.